Facebook has hired former deputy prime minister Sir Nick Clegg as head of its global affairs and communications team. The 51-year-old politician was leader of the Liberal Democrats and formed a coalition government with David Cameron and the Conservatives in 2010. Facebook has faced intense scrutiny and the threat of government regulation following the Cambridge Analytica data scandal and alleged election meddling. Several prominent executives have left the company in the last year. Sir Nick’s new job title will be vice-president of global affairs and communications at Facebook. He will start work on Monday and will spend a week at the company’s Menlo Park headquarters, before moving to California with his family permanently in the new year. My timeline is intriguingly divided between people disappointed with Nick Clegg for going to work for Facebook and people disappointed with Facebook for hiring Nick Clegg. Sir Nick told BBC media editor Amol Rajan he has been working on the frontier between technology and politics for the last few years. “I thought, I could do this academically, as a commentator, running a start-up, but then I thought, in for a penny, in for a pound,” he explained. Facebook founder Mark Zuckerberg and chief operating officer Sheryl Sandberg were personally involved in the recruitment, the Financial Times reported. In a statement, Sir Nick said he was delighted to join the company. “Having spoken at length to Mark and Sheryl over the last few months, I have been struck by their recognition that the company is on a journey which brings new responsibilities not only to the users of Facebook’s apps but to society at large. I hope I will be able to play a role in helping to navigate that journey,” he wrote. The former Lib Dem leader has expanded further on his reasons for joining the company in a Guardian article, stating that he remains “a stubborn optimist about the progressive potential to society of technological innovation”. Sir Nick has previously written about Facebook for a number of UK newspapers. What does Facebook want Sir Nick for? Facebook has had a turbulent few years and is trying to get a grip on its policies and reputation. The Cambridge Analytica data scandal revealed that the personal information of millions of people had been misused, potentially influencing the results of elections. The company has also removed “billions” of fake accounts, linked to the spread of fake news and disinformation, possibly connected to countries such as Russia and Iran. Facebook hopes Sir Nick will challenge the company on its issues. With his political experience as part of the UK government, and as a former MEP, he will also be well-placed to advise how to keep the regulators away. In a Facebook post, Sheryl Sandberg said the company needed “new perspectives to help us though this time of change”. Sir Nick is not the first Liberal Democrat to take a senior role at Facebook. Lord Allan of Hallam is currently the company’s public policy chief for Europe, the Middle East and Africa. 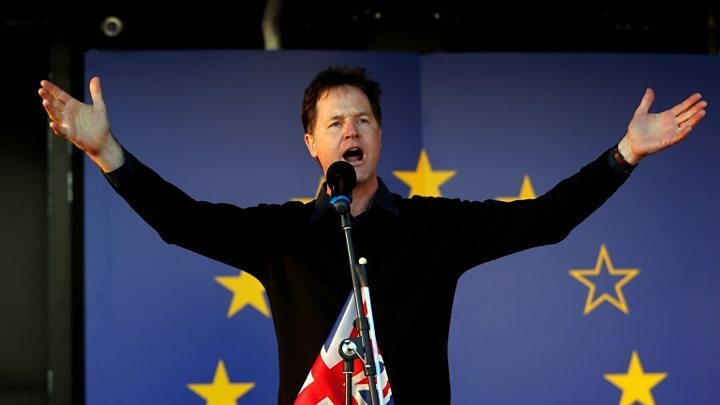 Who is Sir Nick Clegg? Nick Clegg was a Liberal Democrat MP for Sheffield Hallam from 2005 until 2017. In 2010, when he was leader of the Liberal Democrats, he became deputy prime minister in a coalition government with the Conservatives. But he faced a backlash from his supporters when he broke a promise that he would vote against any rise in university tuition fees. The Liberal Democrats lost a majority of their seats in the 2015 general election, ending up with just eight MPs, down from 57. Although he had kept his own seat, Nick Clegg resigned as the party leader. He lost his seat in the snap general election of 2017, but was given a knighthood in January 2018. In his statement announcing his new job at Facebook, he said it was “wrenching” to “leave the public debate at a crucial time in the Brexit process”. “But the key decisions will soon pass to Parliament, of which I am no longer a member, and once I had decided to take up this unique new challenge at Facebook, I felt it was best to get going sooner rather than later,” he said. Jon Trickett MP, Labour’s shadow minister for the cabinet office, said Sir Nick’s new job was “a damning indictment of the sorry state of our country’s politics”. In the UK, the reaction has been “What?” while in the United States and elsewhere most people will say “Who?” – so why has Facebook decided that Sir Nick Clegg is the right fit for one of the most challenging – and best paid – jobs in communications? From the moment in the summer that Sir Nick’s predecessor, Elliot Schrage, announced he was leaving, Facebook made clear that it was not going to look inside or to other seasoned PR professionals for his replacement. Instead, bruised and blinking in the spotlight after a catalogue of scandals tarnished its image, it wanted someone who could guide it through choppy political waters in Washington, Brussels and elsewhere. Given how partisan US politics have become, choosing an American politician would have brought allegations of bias. In the UK, Sir Nick may be a divisive figure – especially over Brexit – but elsewhere that will not be such an issue. Facebook will hope that someone who has survived – just about – the cauldron of British politics will not flinch under fire from US senators or EU regulators. Sir Nick may find he needs to challenge Mark Zuckerberg pretty frequently. Just how well he handles his relationship with his new boss will be crucial. If he succeeds he could wield more power than he ever did in politics. If the relationship sours he will be heading home from California pretty quickly. The ‘coalition quad’ – where are they now? After quitting as prime minister in September 2016, Mr Cameron has taken on a raft of paid and unpaid roles – straddling both the private and charitable sectors. Most recently, he became a paid consultant to life-sciences firm Illumina and vice-chairman of a new UK-China investment fund. He also sits on the boards of a number of organisations involved in international development and foreign relations as well as being president of Alzheimer’s Research UK. Before the former deputy prime minister was hired by Facebook he was busy with his thinktank Open Reason, campaigning for a referendum on the final Brexit deal, and writing his book How To Stop Brexit. The former chancellor added what is thought to be his eighth role to his bulging portfolio of post-politics jobs in May. The London Evening Standard editor was made chairman of a panel of advisers to Exor, which owns Juventus football club and has major stakes in Ferrari and Fiat Chrysler cars. It comes on top of academic posts and a £650,000 a year role with US investment fund Blackrock. After losing his parliamentary seat in 2015, Sir Danny went on to work with the Britain Stronger in Europe campaign and schools cricket charity Chance To Shine. He became vice-president of Chinese-led Asian Infrastructure Investment Bank in 2016. The former Labour cabinet minister took on academic roles when he left politics before a stint on Strictly Come Dancing in 2016 saw him turn his attentions to television, where his BBC documentary, Travels in Trumpland, has proved a success this year. The former Labour leader is still an MP but dips his toes into the world of radio from time to time, standing in for Jeremy Vine on his BBC Radio 2 programme and hosting his own podcast.